Deoghar is located in the Santhal Parganas in the Jharkhand state is popularly known as the Baidyanath Dham. This majestic town is blessed with the presence of one of the 12 Jyotirlinga temples. Being one of the prominent destinations of the Hindus the city receives a large number of tourists from all around the world. The place is dotted with various prime attractions including the Chandrakoopa well, Sivaganga Lake, Harila Joria and the Archaeological Museum. This town witness huge flow of devotees every year. 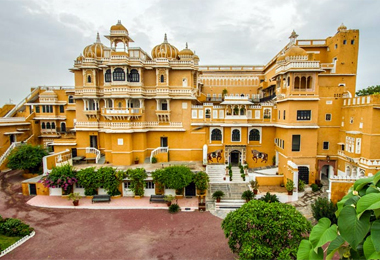 Heritage hotels in Deogarh are built to add to the comfort of the visitors. The heritage hotels of Deogarh are well built and are fitted with all modern day comforts and facilities. The interiors of the heritage hotels are tastefully designed. The rooms feature an elegant décor and delightfully furnished. The well trained staff of the hotel leaves no stone unturned in catering to various needs of its guests. So if you plan to visit Deoghar for your next spiritual vacation book your stay in one of the heritage hotels with HeritagehotelsofIndia, an online travel portal offering great deals and discounts on the booking.